At first glance the old ketch at anchor in Hampton, Va., looked to be a motorsailer, but as I drew closer I realized that wasn’t quite right. It had a ketch rig, but it really looked like an old wooden … Grand Banks? That couldn’t be right, could it? Indeed it was, according to its owner, Mauritz “Moe” Oberholzer, whom I met while registering my boat last June at the marina office. 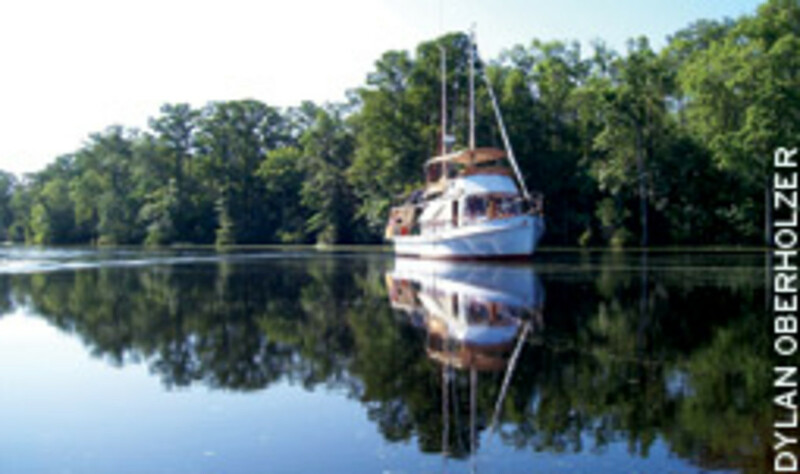 A 1966 twin-engine, teak-hulled, 36-foot, Grand Banks to be precise — christened Jenny Lynn. Moe, 68, is a longtime sailor with two Atlantic crossings under his belt. 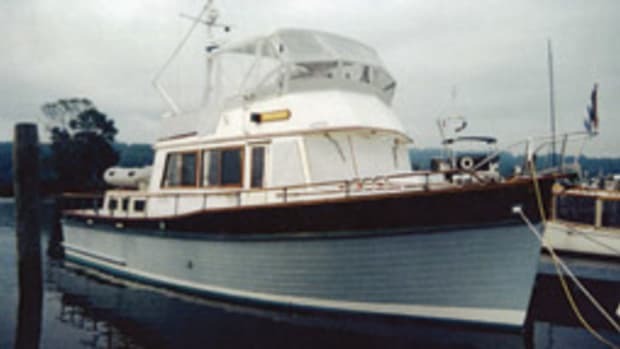 Wanting the room and the ease of cruising it offered, he had bought the old trawler in 2008 in Sacramento, Calif. However, he bemoaned to his son Dylan, 42, a sailmaker, that the cost of running twin engines was prohibitive. So Dylan persuaded his father to put a sailing rig on the boat. As unconventional as it seems, it suits the boat owner, who has lived a less-than-conventional life. From South Africa, Moe and his wife, Dorian, ran a manufacturing business, supplying the country’s tourist trade with jewelry they made. In 1980, they bought a 45 Van de Stadt sailboat and, with little experience and young Dylan, left Cape Town for the new world, where they explored the Caribbean. They wound up in Grenada with a shaft problem — two months ahead of the impending 1983 American invasion — and were unable to continue without repairs. They encountered Cuban soldiers on the island who had an intense dislike of South Africa, which was then fighting Cuba in Angola. With their boat tied to the dock, passports and papers impounded, guarded and under boat arrest most of their time there, Moe feared for himself and his family. An American CIA agent whom they had met while off the boat organized the simultaneous arrival of two American cruise ships in port, according to Moe. While the Cubans were off dealing with the sudden influx of Americans and not watching, Moe says the operative arranged for a local fishing boat to tow the Oberholzers out to sea, where they raised sail and escaped. They continued to cruise the Caribbean and eventually made Puerto Rico and then the U.S. Virgin Islands, where they sold the boat. The purchaser, one of three long-haired “hippies,” trudged down the dock with a huge sack over his shoulder. He had arrived to pay for the boat with $120,000 in cash — in $1, $2, $5, $10 and $20 bills. Moe decided it would be inappropriate to speculate on the origin of the money. As Moe tells the story, it took eight tellers at the local bank an entire day to count the cash. Using these funds, the Oberholzers traveled to America, bought a car and explored the United States. So an unconventional Grand Banks trawler/ketch isn’t so far out of the norm for this family. Jenny Lynn was rebuilt in 2006-07 by her previous owner, getting refurbished engines and other work that an old wooden boat requires. 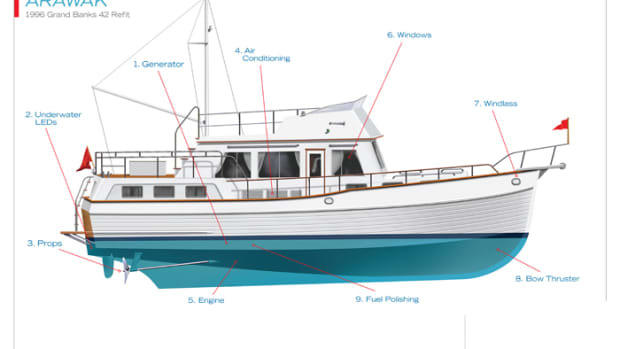 When Moe purchased the venerable, heavy boat in 2008, diesel fuel in California was approaching $6 a gallon, and he thought something had to be done to reduce the cost of cruising. 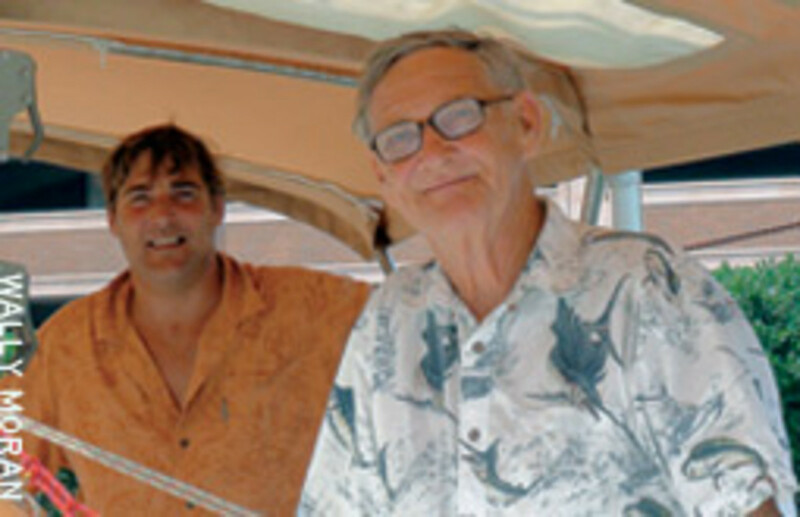 Father and son, noting the boat’s characteristics, thought a sailing rig would work. Dylan says 60 percent of the boat’s weight is below the waterline. 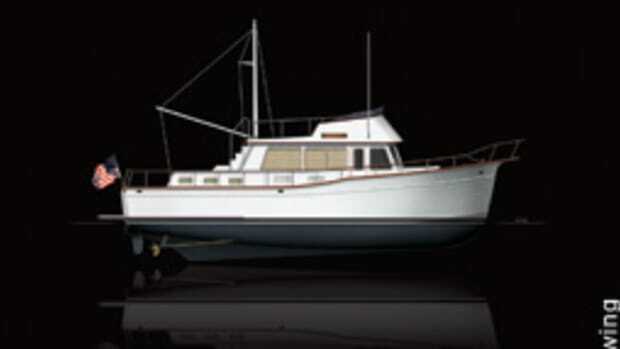 With the vee-hull and semidisplacement characteristics she offered, they believed masts and sails were a workable option. 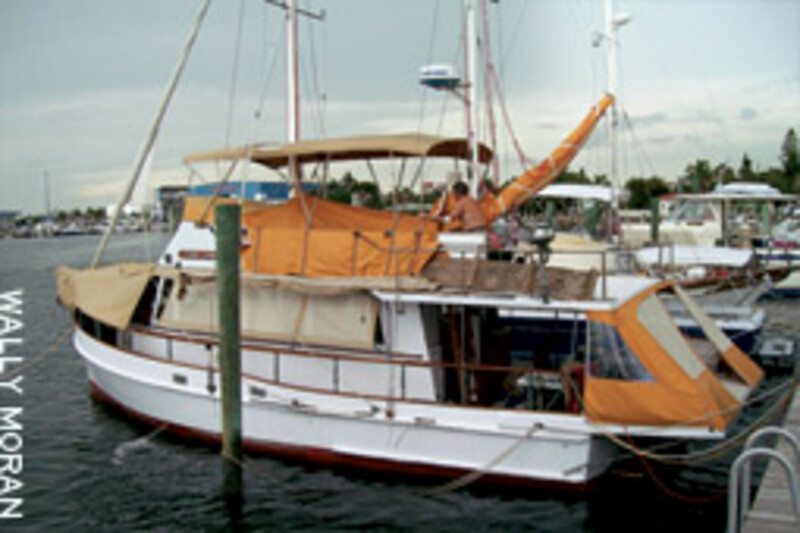 Jenny Lynn’s masts come from boats that Dylan had at one point rerigged. The main mast is keel-stepped, rising some 27 feet above the boat, and the mizzen is deck-stepped with a support post below. Shrouds are led to convenient strong points on the hull, and a high-cut jib is mounted on the forestay. 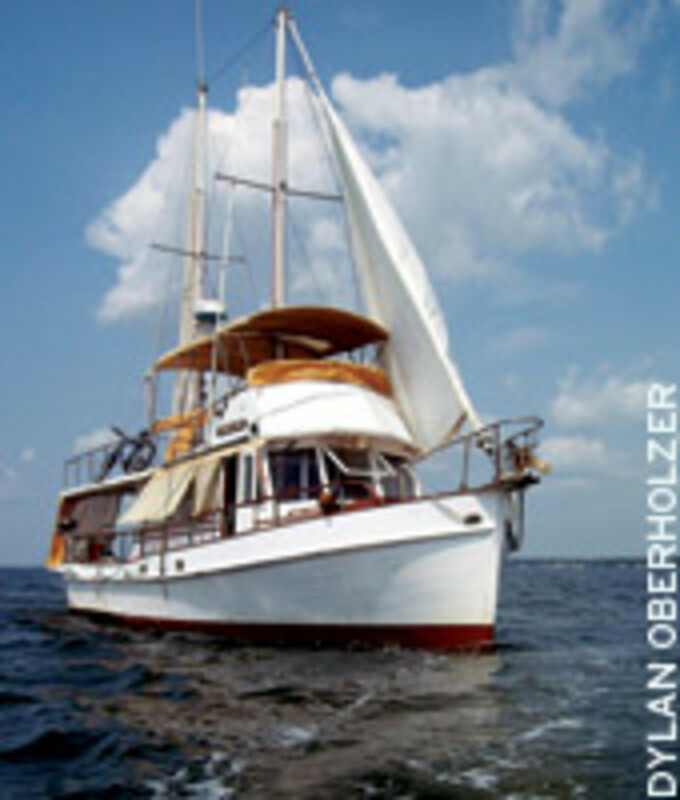 Raising the mainsail involves clearing the Bimini, so Dylan designed and built it to be easily moved out of the way. After running the boat from Sacramento to Panama, they realized that they had two problems: The boat tended to wander, and the stern wanted to broach in following seas. They had a local shipwright add 7 inches to the 5-foot, 8-inch keel over a 28-foot length and lengthen the rudders by 14 inches. Those two steps solved Jenny Lynn’s behavioral problems. So how does this unusual hybrid perform? Moe and Dylan say the boat cruises as if it were designed for the modification and was only waiting for someone to figure it out. Fuel economy, of course, is up. The boat used a total of 2 gallons of fuel an hour cruising at 6 knots on both engines. Under sail and with one engine at about 1,200 rpm, she runs at 7 knots and burns 1 to 1.2 gph, they say. Add to that the savings on running costs — fuel, lubrication, wear and tear, etc. — and the savings are substantial over a season or a cruise. Dylan estimates them at 60 to 70 percent. Dylan, more performance-oriented than his father, notes that at 12 knots of wind on the beam, the mizzen provides 0.45 knots, the main provides 0.6 knots, and the jib adds 1 knot of speed. Both men say, with surprise, that with the wind ahead of the beam, the boat surges as much as 1.5 knots. 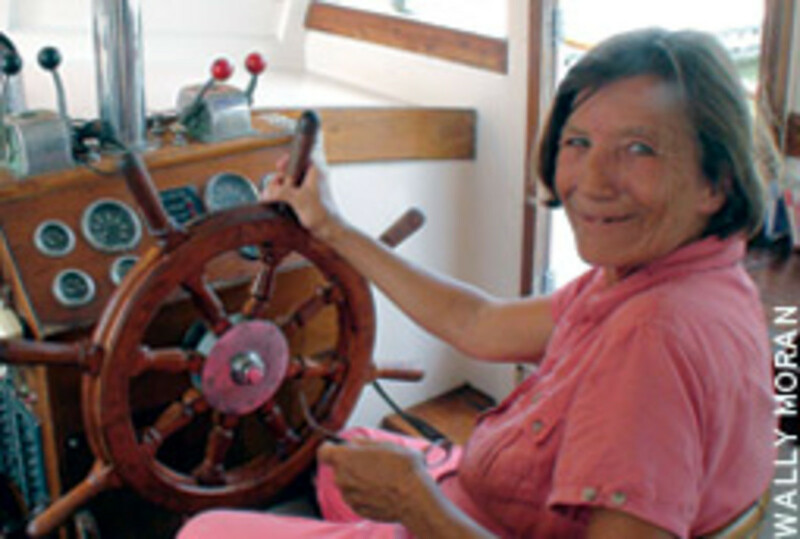 Jenny Lynn doesn’t cruise under sail alone, but with one engine, she generally sails well in most conditions. Moe notes that the biggest improvement from the rig is increased comfort under way. In beam seas, the boat rides more like a sailboat, he says, solid in the water at a 7-degree angle of heel, not yawing, corkscrewing or rolling. 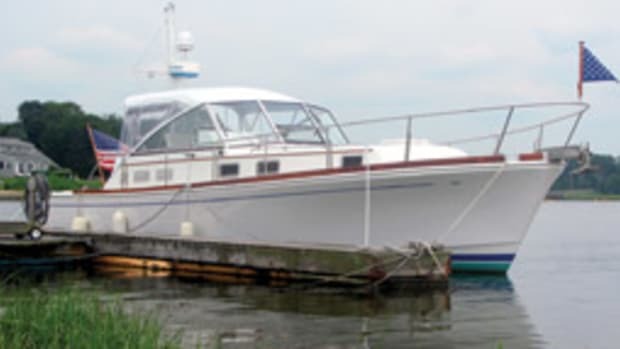 She handles so well, they say, that they can leave the helm for as much as four minutes and the boat comfortably self-steers — something she couldn’t, or wouldn’t, do previously. In stronger winds, they obviously reef the sails. Up to 20 knots, they keep everything up. Above that, they drop the mizzen, at 25 they reef the main and jib, and at 35 there’s nothing left but perhaps 30 percent of the jib. 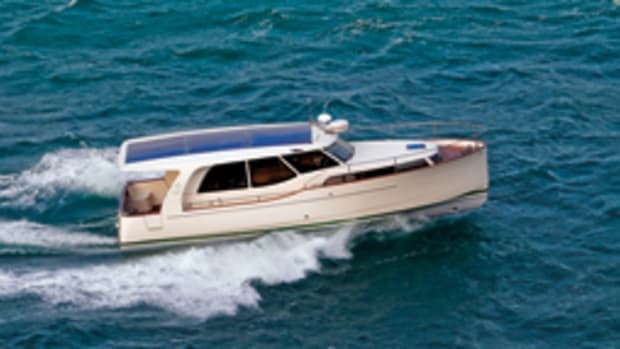 Even then, the hanky-sized piece of sail adds more than a knot of boat speed and stabilizes the ride. “This was an experiment when we started, and it’s very much a work in progress,” Moe says. So much so, in fact, that they once considered adding a bowsprit extending 3 feet and putting in a 10-foot-taller mast for the larger sail area. At that point, they figured they would be able to sail Jenny Lynn at 4 to 5 knots without the engine. 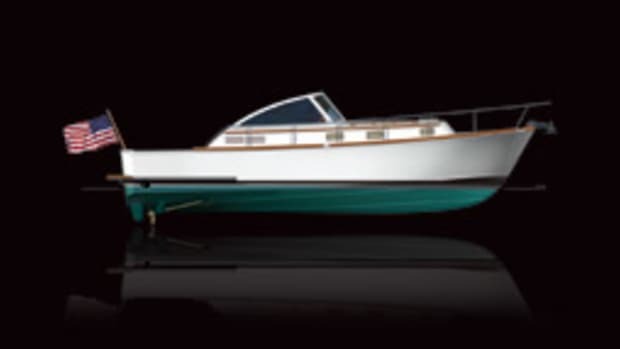 Why not simply purchase a sailboat and be done with it? Moe says that after years of sailing, he and his wife wanted out of the cave-like living spaces of most sailboats and preferred the additional room of a trawler. The drawbacks were increased running costs and the poorer ride. The ketch adaptation solved those issues for Jenny Lynn. Since I last saw the family, Moe had bought an RV to explore the United States and had sold Jenny Lynn to a boater who is now living aboard in the Norfolk area. Contacted in Texas, he told me that their plans are to head north in the summer to explore Canada. 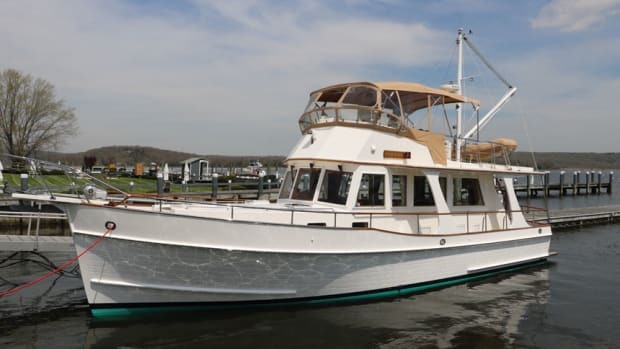 As I left Jenny Lynn in Hampton, it seemed that they had the best of both worlds with their intriguing ketch trawler. Even so, Dylan was eyeing an old 50-plus-foot fishing boat in the harbor and musing that it was a likely candidate for a mast and sails. This article originally appeared in the April 2012 issue. We all know the feeling. Walking off the dock after a day on the water, you can’t resist turning around and taking one last look at your boat. 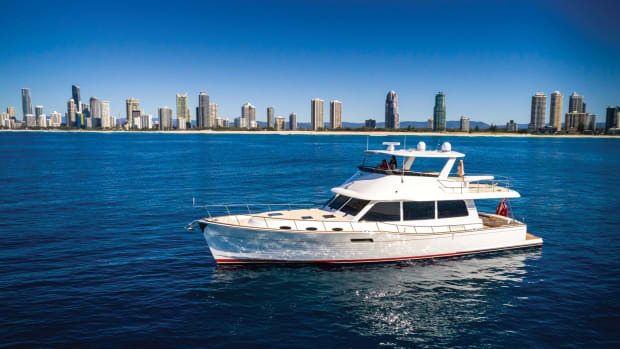 “Supersize me” could be the theme of the Grand Banks 60, which made its world debut at the Sanctuary Cove International Boat Show in Queensland, Australia.